Post rounds completed to comments. Special Warfare Operator 1st Class William Blake Marston, 31, of Concord, New Hampshire, died Jan. 10, 2015, in DeLand, Florida, during military parachute training. Marston was assigned to an East Coast-based SEAL Team and served in the Navy for six years. Marston is survived by his girlfriend, Christine Clark; parents, Bill and Nancy; three siblings, Chris, Jeffrey and Emily; and many other friends and family. U.S. Army Specialist David E. Hickman, 23, of Greensboro, North Carolina, assigned to the 2nd Battalion, 325th Airborne Infantry Regiment, 2nd Brigade Combat Team, 82nd Airborne Division, based in Fort Bragg, North Carolina, died on November 14, 2011, in Baghdad, Iraq, from wounds suffered when insurgents detonated an improvised explosive device near his vehicle. He is survived by his wife Calli, parents David and Veronica, and brother Devon. Run to Fort Crook and back. For the ladder pattern, perform one rep the first minute, two reps the second minute, three reps the third minute, continuing as long as you are able. Use as many sets each minute as needed. Post number of minutes completed for each exercise to comments. 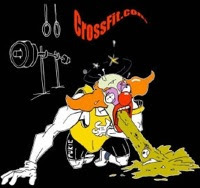 Scott DeTore 12:13, Kelly Guillory 12:44 (14lb ball, 95lb clean, 55lb SDHP). Graham Holmberg 2:04. Post time to comments. If you fall behind the clock keep going for 30 minutes and see how many rounds you can complete. Post results to comments. If you've finished the workout before, this time add +1 rep to each exercise, i.e., 6 pull-ups, 11 push-ups, and 16 squats each minute, and see if you can go the full 30 minutes. Get out and do your sport or activity.